When the surface of the tongue called the dorsum is cracked or has fissures, the condition is known as fissured tongue. This is not harmful and is painless. History indicates that it only occurs among a certain percentage of the population. However, such a condition may either be genetically transmitted or may occur due to degeneration. It may also be a symptom of other health conditions that the individual may be suffering from. Moreover the same condition may have different causes leading to very diverse effects on the individual. Benign Migratory Glossitis – Although the causes behind its condition are unknown, it occurs in almost 3% of the total population. People suffering from this condition are observed to have fissured tongue. As a result they also complain of increased sensitivity to hot or spicy food. Lesions may occur frequently. New lesions may occur as soon as the old ones begin to heal. It occurs on the erythematic area of the tongue while the atrophy of the filiform papillae of the tongue is surrounded by white hyperkeratotic border. Melkersson Rosenthal Syndrome – This is a rare neurological disorder that is transmitted to individuals genetically. It may also be caused due to dietary reasons or other allergens. It is characterized by the weakening of facial muscles, swelling of both or one lip, swelling of the face and a fissured tongue. These characteristics may reoccur from time to time. Facial palsy is another feature of this condition and there are chances that it may permanently affect the individual. Down syndrome – It is a disorder that occurs due to chromosomal disorder. It is a genetic disorder that has various physical and mental effects on the individual throughout their life. About 80% of the people who suffer from chromosomal disorders have fissured tongue. Folic acid – The nutrient is essential for pregnant ladies, breastfeeding mothers and adults during their reproductive years. However, it is also known to aggravate sores or cracks that may already be present on the tongue. It causes faster formation of cracks on the tongue. Biotin – Biotin is another important component that is essential for the healthy functioning of the body. Deficiency of biotin may cause fatigue, paleness and cracking on the surface of the tongue. Ariboflavinosis – Riboflavin helps in the uptake of folate, iron and niacin. Its deficiency is known as ariboflavinosis. 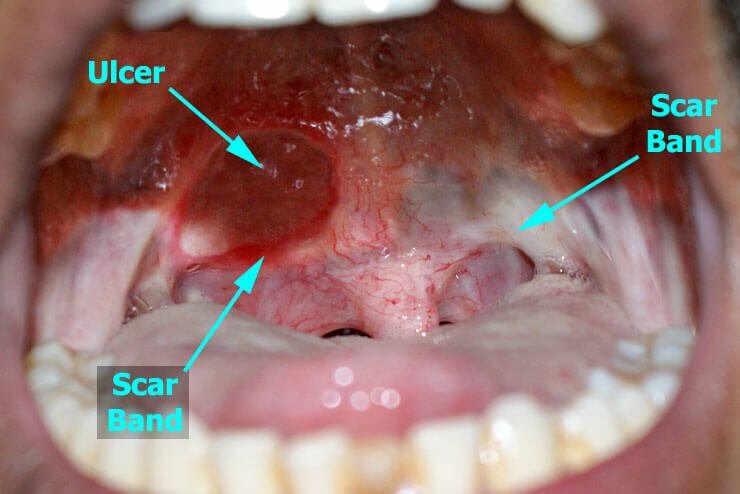 Under such conditions people experience swelling and soreness of the throat, cracked skin at the corners of the mouth, swollen or cracked tongue. Usually, a swollen tongue may get irritated and result in a fissured tongue. Tongue bites – The tip and sides of the tongue are closest to the teeth. While eating or talking people may accidentally bite their tongue. These bites may also develop into sores in the future resulting in cracks or fissures that are painful to touch. Cuts – Cuts on the tongue may occur while having food with sharp edges that can easily cut the tongue. These cuts can then develop into cracks. Eating dry foods or the presence of broken or chipped teeth in the mouth may also cause such situations. Lacerations – Head concussions, seizures, etc. occurs with excessive force. In such cases the tongue may get caught between the teeth. They may vary in intensity. However, deep cuts may take time to heal and result in deep fissure or cracks on the tongue. Teeth grinding – Children having a habit of grinding their teeth while they are asleep may have fissured tongues. A mouth guard could be used in order to prevent cracks on the tip and the sides of the tongue. Diagnosis of fissured tongue usually happens through routine dental checkups. It is during these sessions that the dentist is able to observe the cracks on the individual’s tongue while examining his/her teeth. Usually, this condition does not require a biopsy. Oral hygiene – Maintaining proper oral hygiene is important to treat a fissured tongue. The surface of the tongue must be brushed and kept clean in order to remove food debris and avoid collection of plaque and bacteria in the fissures. These conditions could also lead to tooth decay and bad breathe. Flossing – Using a good flossing medicine could be beneficial in such situations. It cleans the mouth and its antibiotic properties help to reduce bacteria in the mouth and reduce risk of disease, infections and intensity of the situation. Hydration – Drinking water helps to wash out the debris from the fissures in the tongue. It prevents the growth of bacteria in the mouth and does not allow infestation and infection. Thus it also reduces the chances of irritation and inflammation of the tongue. Gargling with ginger and garlic – A paste of garlic and onion can be added to a glass of water and a paste of ginger can be added to another glass of water. Gargling with these two mixtures alternatively can help to treat the fissures. Fennel seeds – Chewing on fennel seeds can help to keep the moth hydrated and help to get rid of bad breathe. While chewing on the seeds the salivary glands get stimulated to produce more saliva, thus the debris in the fissures can be removed. Aloe Vera gel – It has the ability to hydrate and soothe injuries. Having half a glass of aloe extracts can help to heal this condition. Neem (Margosa) – Its medicinal values include anti bacterial qualities. It helps to reduce infections, bacterial growth, week teeth, infected gums, etc. Mint leaves – Boiling mint leaves in water and drinking it once a day, helps to reduce pain. The burning sensation caused due to the intake of spicy food may be substantially reduced. There are certain activities and habits that people should avoid while suffering from fissured tongue. Smoking should be avoided. The tongue may be sensitive to such substances. Moreover, chances of fungal infections are reduced to a large extent if one stops smoking. Fissured tongue has heightened sensitivity. Spicy food may cause a burning sensation. If the sores in the mouth get exposed to heat, acidic substances or other harmful beverages, they take a longer time to heal. Fissured tongue is not a harmful condition. It is usually a painless condition. Often it heals on its own without any external medication or treatment. However, if the situation intensifies and excessive pain and burning sensation are experienced making intake of food and talking difficult, then medical supervision is required.